Only 3 hours from Durban and 4 hours from Johannesburg, Nambiti game reserve is home to the spectacular setting of Cheetah Ridge Lodge. Child friendly accommodation options, Romantic Suites and an exclusive use Self Catering House ensure the Lodge has an option for all it's clients. 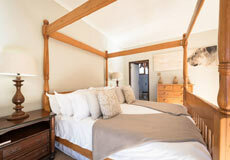 A Fully Catered Game lodge experience is available in 10 luxury suites, ideal for couples, or couples with young kids. 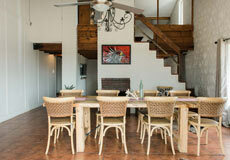 For larger families or perhaps families traveling with more than 2 generations the Family suite sleeps up to 6 people. Accommodates up to 10 people comfortably in 5 unique spacious bedrooms one of which is an en-suite bathroom. Cheetah Ridge Lodge’s three tailored accommodation options make it the ideal destination for families of all sizes as well as couples and solo travelers. Your 3 accommodation options include Fully-catered accommodation in 10 luxury suites overlooking a private watering hole; A family suite, which sleeps up to six people, situated in the Main Lodge; Nambiti House, a separate run self-catering lodge located close to the main Lodge and suits extended families or a group of friends. 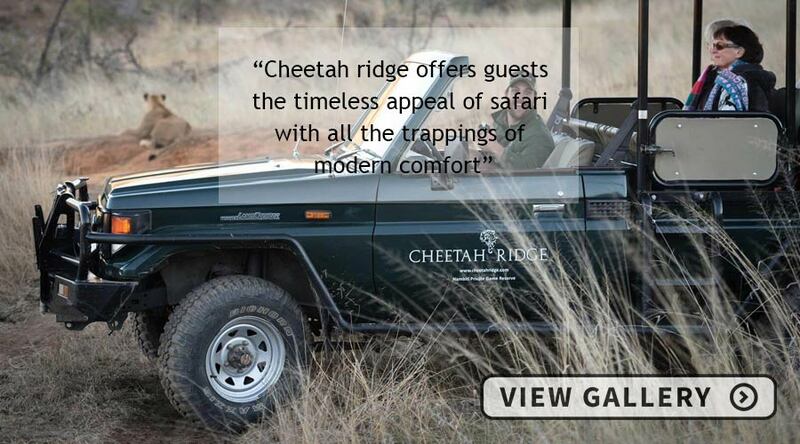 Situated slightly away from the main lodge the 10 suites all have a viewing deck looking over a watering hole. The suites are all equipped with an air-conditioning unit and ceiling fans, with a Bosca Fireplace and Nespresso coffee machine for chilly nights. Other amenities include mini bar, telephone, safe, mosquito net and have an en-suite en-suite bathroom and outside showers to keep yourself refreshed. This Suite accommodates up to six guests with four-poster king size beds as well as two single beds in an adjoining nook, each with its own en-suite bathroom. 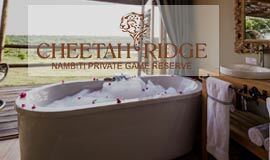 Suite contains a private lounge area, with a private balcony overlooking the beautiful Private Nambiti Game Reserve. The Self Catering house at Nambiti House is set just 100m away from the Cheetah Ridge Lodge but private enough for your group to enjoy there own company. Isolated apart in its own fenced-off garden, Nambiti House comfortably accommodates up to 10 people in five spacious bedrooms. 3 of the bedrooms lead onto a sheltered veranda. 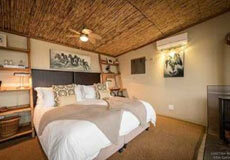 Excludes A Rhino Conservation Levy of R 50.00 per person per night is to be settled directly with the lodge on checkout. Levy subject the change without prior notice. 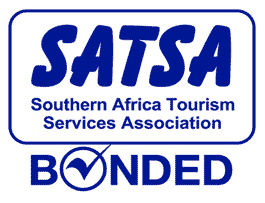 Special rates quoted may only applicable to South African Residents. Discounted special rates for International Residents are available on request. The Lodge will require proof of residency on check in. Children 0-2 years of age will stay free of charge when sharing with two full paying adults.. Maximum of 2 children sharing with 2 adults.